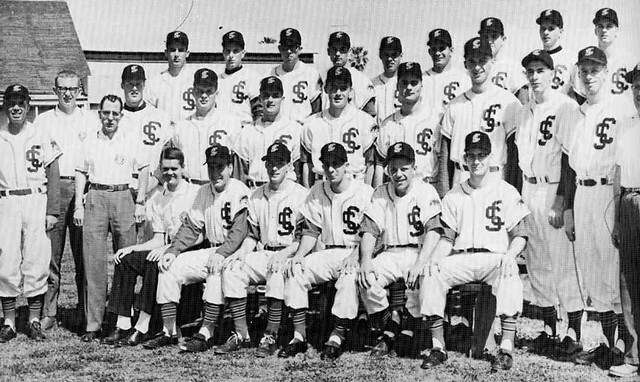 The 1962 Broncos pitched, ran, and swatted their way to being the top-ranked team in the nation and to the College World Series. Then they battled it out in a grueling 15-inning title cruncher that was one for the record books. 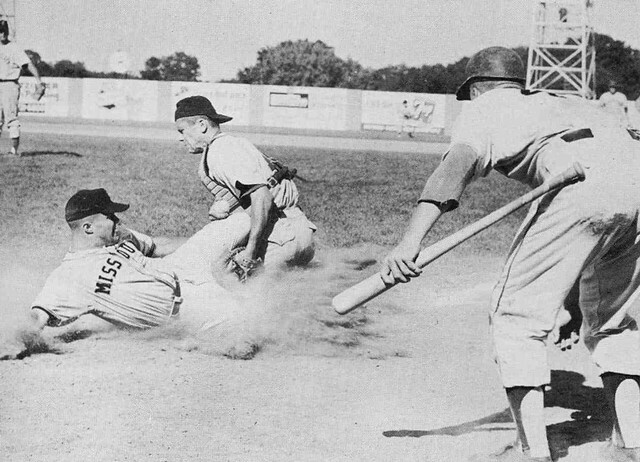 Fifty years later, Ron Calcagno ’63 clings to one very appetizing memory of his trip to the College World Series. 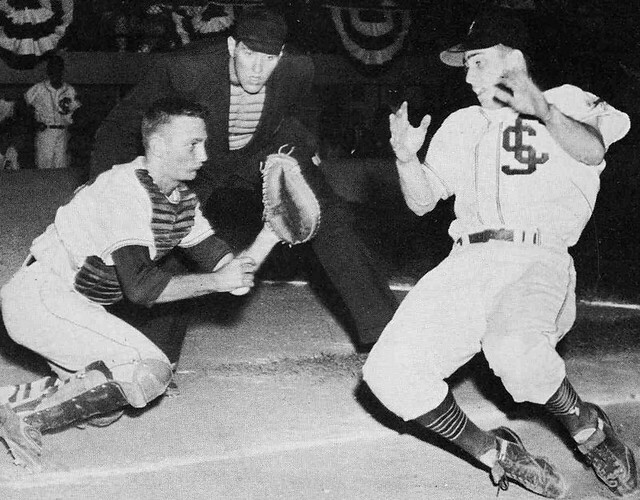 Calcagno was the catcher on Santa Clara’s first—and still only—team to reach the collegiate championship game of a sport that has been played at the University longer than any other. 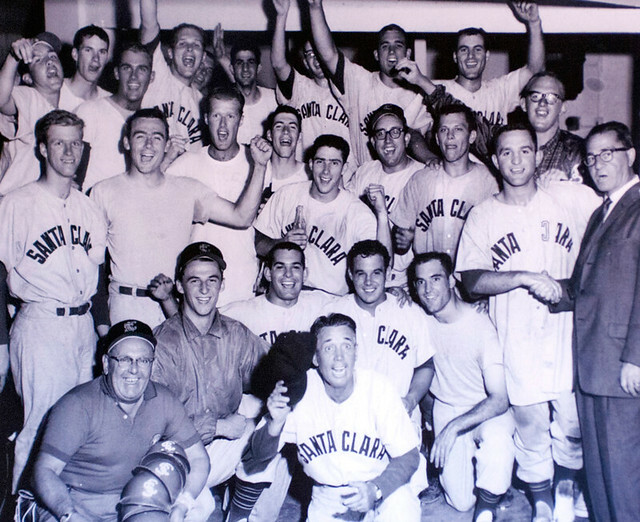 Baseball at Santa Clara began in 1883, yet the 1962 Broncos, who came so close to winning the NCAA title before losing it in extra innings, stand alone in school history. All of them can tell you it was an unforgettable experience. You know that it’s pretty darned cool to get up every morning and prepare for the biggest game of your life—for three straight weeks. That’s what you know. You just keep playing and see what happens next. Anyone can read the numbers and facts about those magical weeks. How the Broncos blitzed through the regional qualifying tournament and went to Omaha as the tournament’s top-ranked remaining team. How they lost their opener to Florida State, putting them in peril of being eliminated with just one more loss. How they clawed back to win four straight games and face Michigan for the championship trophy. How they lost, 5–4, in 15 innings to the Wolverines. How pitcher Bob Garibaldi ’64 kept throwing heat day after day and set World Series records with 38 strikeouts and 27 1/3 innings pitched, records that still stand today. The Broncos’ games were broadcast on radio throughout the South Bay. One person listening to every pitch was Tom McEnery ’67, M.A. ’70, then a senior at Bellarmine Prep who knew he would be attending Santa Clara that autumn. McEnery, a future mayor of San Jose, recalls that the entire South Bay was riveted to every game. Meanwhile, as they bunked out in Omaha and ate sirloin, the Broncos were largely unaware of the fuss they were creating back home. “We didn’t have an entourage or a posse,” jokes Calcagno, though he does recall several SCU classmates making the trip to Nebraska and sleeping on the floors of players’ hotel rooms. Paddy Cottrell, the team’s coach, didn’t seem to mind. 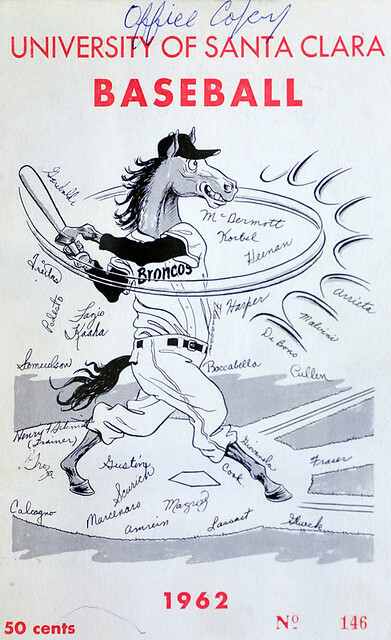 According to Calcagno, the large Italian-American community in Omaha also turned out in big numbers to back the Broncos because of the heritage reflected on their roster. 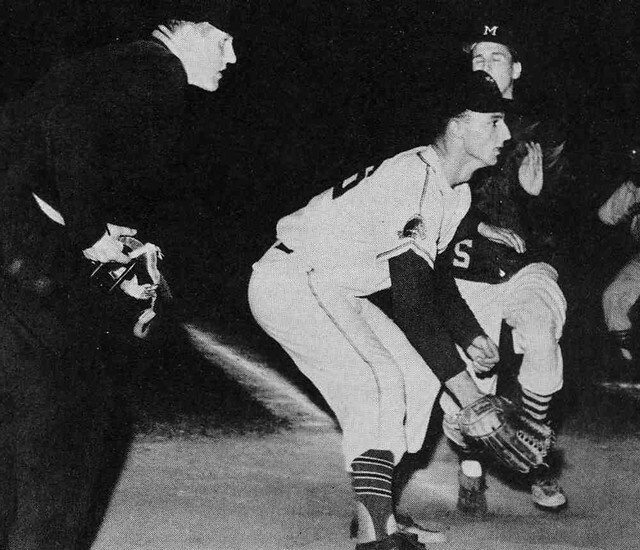 Besides Calcagno and Garibaldi and Boccabella, the lineup featured shortstop Ernie Fazio ’63 and pitcher Pete Magrini ’66. 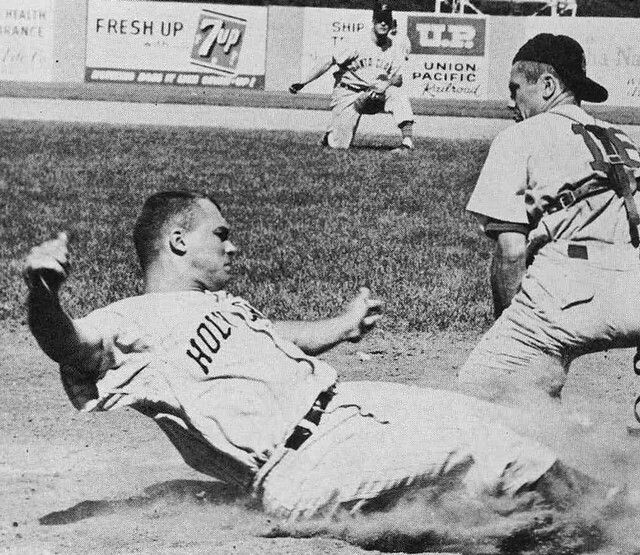 Calcagno was the only one of the five who failed to reach the Major Leagues; Tim Cullen ’64also played ball in the majors. In January 2012, the 1962 team held one of its frequent reunions. But this golden anniversary get-together took place on campus before a Santa Clara basketball game, where the players were introduced to the crowd. Seventeen of the 19 living players attended. After all the previous reunions, you’d think no new stories would surface. But one did. It seems that a few years ago, Garibaldi was on an ocean cruise. 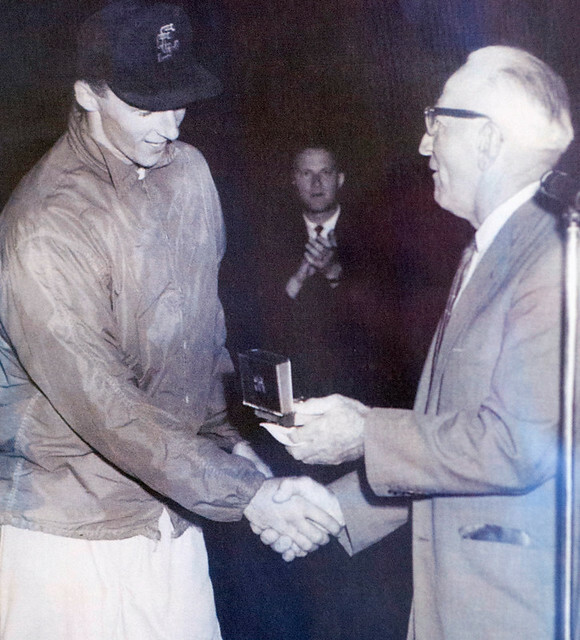 He struck up a conversation with a man from Omaha who said he’d attended nearly every College World Series since the event moved there in 1950. Garibaldi never introduced himself or spoke of his own exploits. 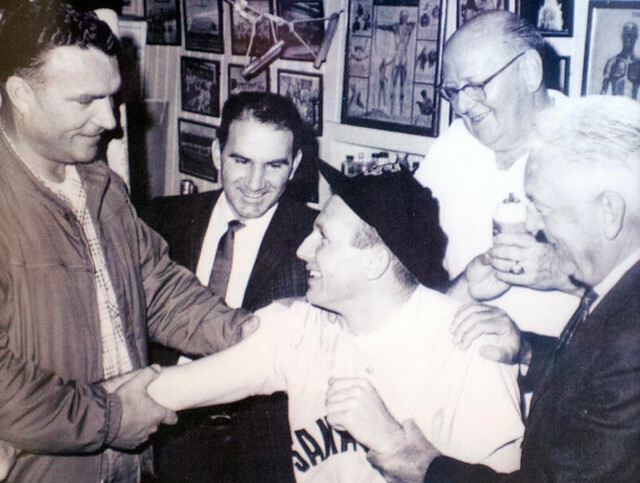 But he did ask the Omaha fellow about the best players and teams he might have witnessed. 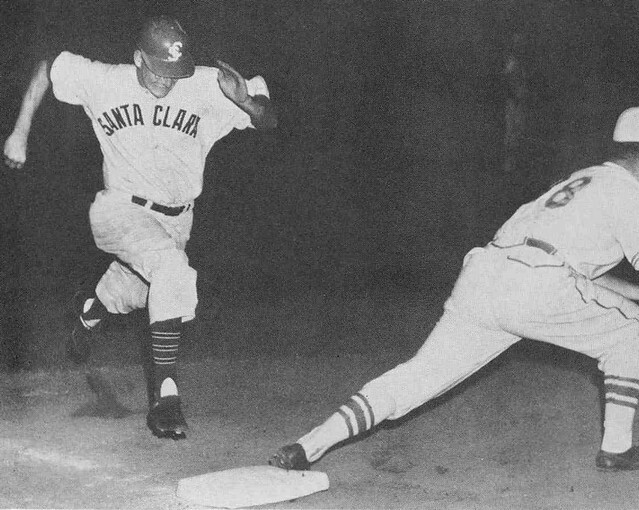 Without prompting and within seconds, the man offered that the 1962 Santa Clara team was the best he’d ever seen—and recounted how the Broncos had lost that grueling 15-inning title cruncher. It’s still tied for the longest game in World Series history. The Boys of ’62 have that. 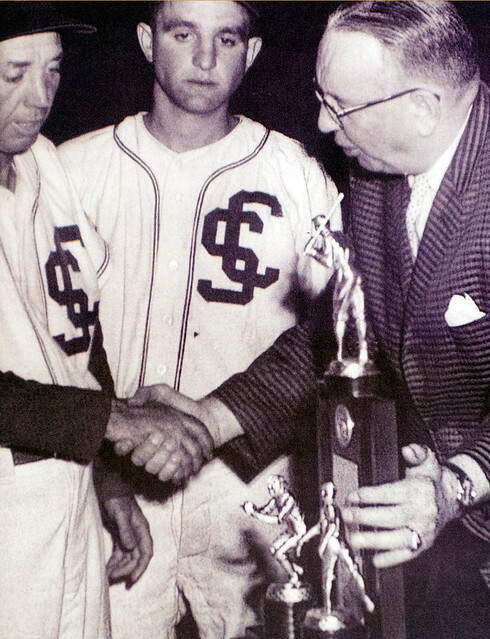 And, in addition to sharing memories, they are puzzled about why no subsequent SCU team has made it to Omaha. They are rooting hard for one to return soon. 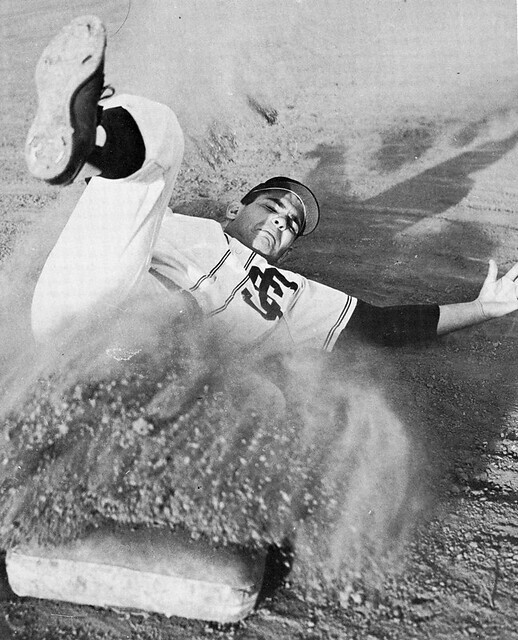 The boys of summer ’62: See photos from the storybook season in the gallery below.